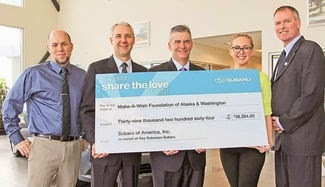 Local Roy Robinson Subaru dealership is donating $39,264 to the Make-A-Wish office of Alaska and Washington as part of Subaru's "Share the Love" event. The car dealership presented their check on March 16. As part of the "Share the Love" event from Nov. 20, 2014 to Jan. 2, 2015 customers who purchased or leased a new Subaru vehicle could select from a list of charities to receive a $250 donation from Subaru of America. The local Roy Robinson dealership has participated in the program since its inception seven years ago, said general manager Mark King. Subaru of America selects four national charities that customers can donate to, but starting in 2014 local dealerships were allowed to select a local charity that customers could donate to. This is the second year that the Make-A-Wish office of Alaska and Washington was chosen by the local dealership. "Three years ago we sponsored a Make-A-Wish child named Josh who lived in the Lake Stevens area. We basically picked [their foundation] because of a past experience like that which went well," said King. King's wife has been a volunteer for their office as well. "She was the one working with Josh. So our dealership already had a relationship with their office that way," said King. It has become a popular program at the local Roy Robinson dealership, said King. Last year the program brought in $14,000 for the local Make-A-Wish office and this year about $39,000. "When you get a three-fold increase in customer response, that's always a positive," he said. King added that giving local dealerships the choice to promote local charities gives customers better options. "People like to help those local charities instead of just the nationals because the money stays local. And when you have a child right in your own backyard that can use it, what better way to spend your money than that can you have," he said. Over the last seven years Subaru of America has donated about $50 million altogether through their "Share the Love" event.